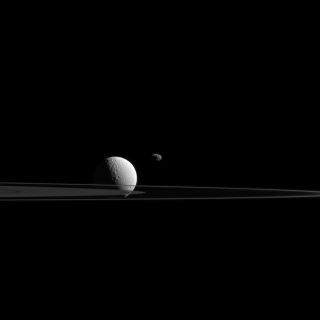 Saturn's moons Tethys (left) and Janus hang near the planet's rings in this image captured on Oct. 27, 2015 by NASA's Cassini spacecraft. Two very different Saturn moons hang near the giant planet's iconic rings in a beatiful new photo from NASA's Cassini spacecraft. The photo, which was taken on Oct. 27 but just released Tuesday (Jan. 19), shows the spherical Tethys and the lumpy Janus, whose disparate shapes are a direct result of their divergent sizes. "Moons like Tethys (660 miles or 1,062 kilometers across) are large enough that their own gravity is sufficient to overcome the material strength of the substances they are made of (mostly ice in the case of Tethys) and mold them into spherical shapes," NASA officials wrote in a description of the image. "But small moons like Janus (111 miles or 179 kilometers across) are not massive enough for their gravity to form them into a sphere," they added. "Janus and its like are left as irregularly shaped bodies." Cassini was about 593,000 miles (955,000 km) from Janus and 810,000 miles (1.3 million km) from Tethys when it took the picture, NASA officials said. The new photo depics Janus with a resolution of 3.7 miles (6 km) per pixel, and Tethys with a resolution of 5 miles (8 km) per pixel. The $3.2 billion Cassini mission is a joint effort involving NASA, the European Space Agency and the Italian Space Agency. The Cassini spacecraft launched in 1997, arrived in the Saturn system in 2004, and delivered a lander called Huygens to Titan's surface in early 2005. Cassini will continue studying Saturn and its moons until September 2017, when the probe will intentionally plunge into the ringed planet's atmosphere.